Stainless steel case with a stainless steel bracelet with black ceramic center links. Fixed grey ceramic bezel with tachymeter. Gray dial with luminous hands and index hour markers. Minute markers around the outer rim. Dial type: Analog. Luminescent hands and markers. Date display at the 3 o'clock position. Chronograph - three sub-dials displaying: 60 second, 30 minute and 12 hour. Automatic movement. Scratch resistant sapphire crystal. Screw down crown. Solid case back. Case diameter: 44 mm. Round case shape. Band width: 22 mm. Band Length: 9 inches. Deployment clasp with push button release. Water resistant at 200 meters / 660 feet. Functions: chronograph, date, hour, minute, second. Luxury watch style. Watch label: Swiss made. 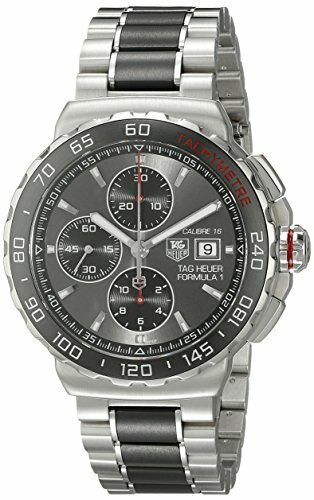 Tag Heuer Formula 1 anthracite dial steel and ceramic chronograph Men's watch CAU2011.BA0873.